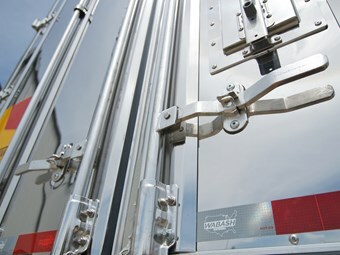 Several Wabash National products will be available through Mezz Trailers from July. Big US semi-trailer builder Wabash has announced an agreement with WA-based Mezz Trailers to bring several of its brands Down Under. The company says several products will be available through Mezz Trailers from July. They include Wabash National "DuraPlate" dry vans; Wabash National "ArcticLite" refrigerated vans; "Transcraft" steel and hybrid flatbed and drop deck trailers; and "Benson" aluminum flatbed and drop deck trailers. "We’re pleased to offer new trailer options designed for the harsh conditions Australian fleets face in their daily operations," says Brent Yeagy, group president of commercial trailer products at Wabash National. "Although manufacturing a product for export can be challenging, our manufacturing operations are capable of building to a diverse set of customer needs,"
Wabash says it uses steel grades that exceed Australian standards. "In working in partnership with Wabash, we will be working with a household name in trailers — one that is extremely well-respected around the world," says Nigel Withnell, sales manager for Mezz Trailers.